Settling In: A Mutual Process? I’ve seen a lot of YAV blog posts handling the question, “How are you settling in?” I’ve really enjoyed the responses and reinterpretations of the question, so I figured I’d give it a stab. After all, it’s more than appropriate to address when I consider how much I struggled at the beginning of the program. This past weekend involved a lot of “settling in” activities. First, I got a clearly assigned cleaning job. Not only will Jenny be pumped (she’s been subtle hinting that we all get a defined job), but it also felt somehow edifying to fulfill a clear role. It’s not particularly complicated or anything. I just sweep, mop, and tidy the living room. So I clean up after Ani and Franco who manage to mussy it up at least once a week. Still it felt great to have a task, to support. Also, Paco and I moved a dresser into my room. I’d been living out of a suitcase for the last two weeks, in addition to the two weeks in Lima. It felt weird to do laundry, but put all my clothes into my suitcase. Like I was using my room as a base camp, but I was living there. The dresser isn’t what you’d call intact. It’s missing four out of six drawers. Still, it holds my clothes (feeling glad I left stuff home) and more importantly, my suitcase now resides under my bed. My room feels lived in, not used. Then we visited with Celia’s family in nearby district. Her sister and brother-in-law run a local general store and fried chicken place. Over phenomenal fried chicken (a second lunch after the party), we talked politics (October 5th is Election Day), religion, and general jokes. After a few hours, we headed over to the “Juegos,” a staple in residential Ayacucho. They consist of massive trampolines, a line of fooseball tables, and usually some other type of fun-generating capital. Ani and Franco leapt onto the trampoline while I split my time being sitting with Celia and Paco and trying to capture a photo of every bounce. I’m trying to cool it with the camera, but it’s hard. Ani and Franco are really cute when they’re having fun. Not to mention all the amazing sights around Ayacucho. Then on Sunday, I went to a rural church with Paco. He was guest preaching, while I watched Franco and Ani. The trickiest part was keeping them together so I could pay attention to both. It wasn’t always easy and it involved a lot of time running after them in the blazing sun (I’ve got the toasted face to prove it!). Yet, I felt trusted by Franco, which added to the weekend of connecting with the family. 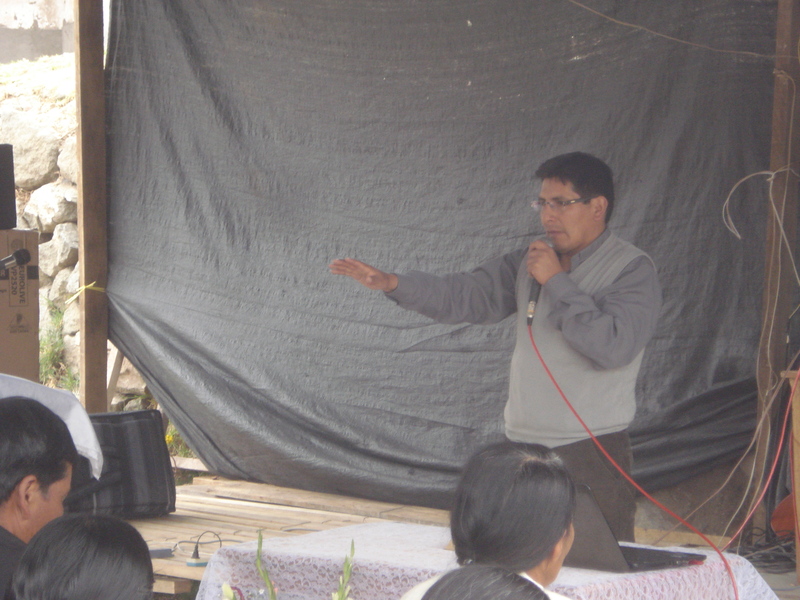 Paco preached for 2 1/2 hours on Sunday. Woah. Of course, I’m still struggling with Ani. The thing is she cries and hits when she’s upset and she laughs and hits when she’s happy. She’s a little entitled at times and plays well into the nickname “princess” that Paco and Celia sometimes use. That wouldn’t bother me much, except that when she’s not happy, she wants nothing to do with me. She doesn’t want me around. For example, when she’s tired in the mornings, she gets upset upon looking at me. I immediately feel like perhaps I should not be around. Worse, when she’s being forced to do something she doesn’t want, like eat or go to bed, she’ll tell Paco or Celia that I hit her. Paco and Celia brush it off, as apparently this is a common lie. I’m greatly for their trust, but this is not exactly comforting. Why am I telling you all about this? Why pepper in all my discomfort about working with Ani? The thing is, I’ve found that the question of settling in can’t be answered from my perspective alone. The people I interact with regularly, so Ani, also need to settle in to my presence. I can know my way around Ayacucho better than a local (unlikely), I can become a cleaning expert, I can visit churches as much as I want with Paco, and visit with extended family all I want, but if Ani doesn’t accept me in the house, I will still feel a little unsettled. That’s a lot of power for the youngest member of the family. Yet it’s true. When Ani points her displeasure at me, I am reminded that I’m an outsider. In some ways, that’s good. I am an outsider and it would be unwise to forget that. It’s part of my identity and the way others see me. Still, I’m trying to brush it off. On becoming compassionate with how Ani acts when she is uncomfortable. As I explained to Celia’s cousin, when she’s tired, Ani doesn’t want to deal with me. She wants normal and that’s not me (yet). And on a brighter note, I should add, I think it’s starting to change. Take this vignette. As we arrived back in Ayacucho on Sunday, I lifted Ani out of the van. Unfortunately, she took this opportunity to reach for my face and attempt to grab my nose. (I recently taught them, “I’ve got your nose.”) Seeing her uncoordinated hands rushing towards my face, I jerked back, thinking that she had solid footing on the ground. Of course, she was too focused on my nose to think about standing and promptly fell backward and burst into tears on the sidewalk. I immediately bent to apologize, as she started to cry and she swatted me, saying, “Estás malo.” Here we go again, I thought, she won’t want me around. She hid for a bit, but eventually started to smile, clearly feeling better. And then she said that maybe she’d be able to forgive me tomorrow, but she didn’t think she could today. And that felt awesome. As I see it, Ani is starting to see that our relationship extends into the future. Little by little, she’s growing to accept my presence. And nothing could help me settle in more.